At the Recreational Fishing Alliance (RFA), we’re here to protect your right to fish! 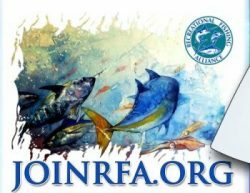 Incorporated in 1996 as a 501(c)(4) national, grassroots political action organization, RFA is in the trenches, lobbying, educating decision makers and ensuring that the interests of America’s coastal anglers are being heard loud and clear. Click here to learn more about what we’re up against, and why joining the Recreational Fishing Alliance (RFA) is so important when it comes to protecting your right to fish. RFA was the first national, grassroots political action organization established to represent the rights of recreational fishermen and the recreational fishing industry as a whole on marine fisheries issues, and we remain the only one. Click here to receive free RFA email alerts and bulletins (secured through Constant Contact)! You’ll find unique articles about fisheries management written by and about some of the most recognizable advocates in the recreational fishing community, including Gary Caputi, Barry Gibson, Tred Barta, Jim Donofrio, Jim Hutchinson, Jack Holmes, Tom Hilton and more.